costs Germany: Up to a purchase price for patches of € 20.00 shipping costs will be a flat rate of 1,50 € including 19% VAT. From an order value of 20,00 € the dispatch FREE SHIPPING is done! 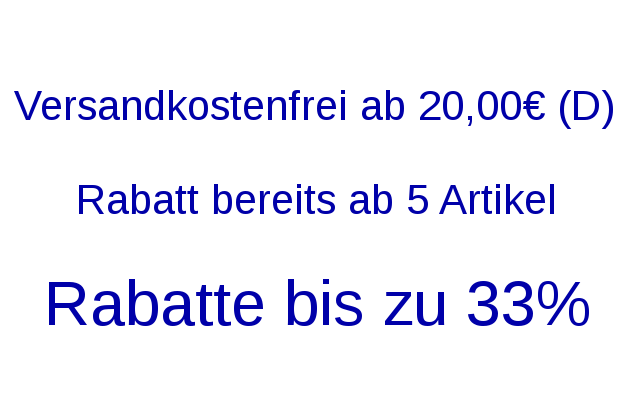 costs Germany: Up to a purchase price for fabrics and cushions of € 30.00 shipping costs will be a flat rate of 3,99 € including 19% VAT. From an order value of 30,00 € the dispatch FREE SHIPPING is done! Costs outer Germany: Up to a purchase for patches price of € 35.00 shipping costs will be a flat rate of 6,00 € including 19% VAT. From an order value of 50,00 € the dispatch FREE SHIPPING is done! up to € 20.00 shipping costs will be a flat rate of 7,75 € including 19% VAT. between € 20.00 and € 40.00 will be a flat rate of € 9.95 including 19% VAT. between € 40.00 and € 150.00 will be a flat rate of € 14.95 including 19% VAT. From an order value of 150,00 € the dispatch FREE SHIPPING is done! Ready for shipment, shipped the first working day after receipt of payment term of shipment 1-2 Working days. This statement is valid for shipments within Germany. *For deliveries to non-EU countries additional duties, taxes and fees. Related content on tariffs, see inter alia http://ec.europa.eu/taxation_customs/common/legislation/legislation/customs/index_de.htm and import turnover tax http://www.zoll.de/DE/Fachthemen/taxes/import tax/einfuhrumsatzsteuer_node.html and in particular for Switzerland: http://xtares.admin.ch/tares/login/loginFormFiller.do. If you like to order for more than 1000,00€ please send a message.